Our 'MARRIED LIFE POEMS' - written and artworked by Pearl and Earl creator Jacqui Pearce make a fantastic wedding, valentines or 1st Anniversary PAPER gift. 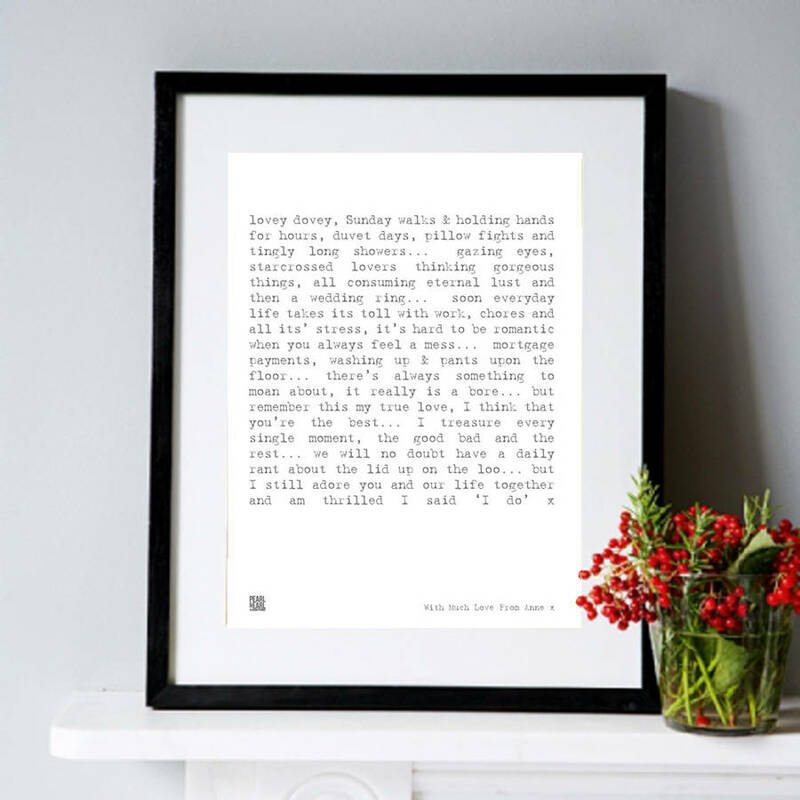 This poem makes the perfect gift for your wife or husband for anniversarys at Christmas or when you want to show that you appreciate them. 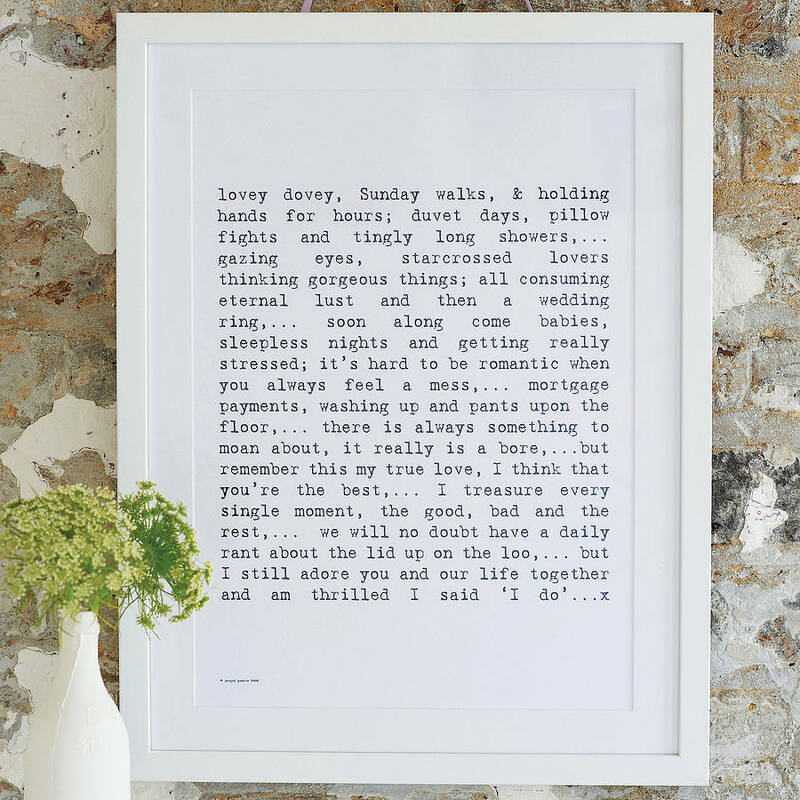 Our art prints and poems have been designed and composed in house by Jacqui since 2007, and are based on her own fond memories and experiences. We have won multiple awards for our art prints and they have featured on TV, Style Shows and editorial like Easy Living, Living Etc and Brides. 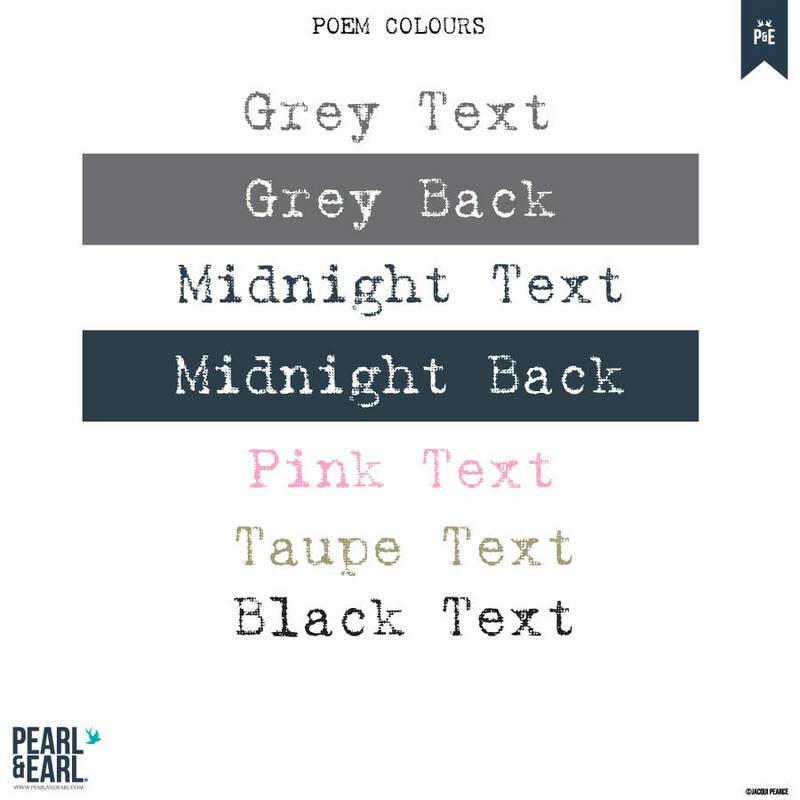 Choose from 7 colour options and sizes A4, A3 or A2. We also have a version of the poem with or without children. Choose print only, personalised or to have your print framed (we cannot ship framing internationally). Frames come in black or white. For an additional fee you can add a personalised message text in the bottom right hand corner (12 pt which is a little smaller than the poem text). Poem words and style strictly copyrighted - J Pearce 2009. Archival 300gsm hammered matte paper - a specially coated art card, which produces the best finish with the inks. Archival papers do not yellow with age. Giclée' printed in house to fine art standards. Machines need at least an eight colour mix to achieve this and we do not use simple desktop printers. Frame - 2.2cm smooth silk finish painted solid wood, cut, glued and fixed to order. Glazed with top grade acrylic, which has 99% clarity without the health and safety and breakage problems of glass. It actually costs us more! They are pre strapped ready to hang. Mount - The black and snow white thick mounts are cut by hand to fit each piece. Approx 3.5cm around each edge. Framing is completed by our local framer who is second to none. He frames for designers like Paul Smith and top London Galleries. Framing can take up to 10 days due to the artisan work involved. Note: The framing costs may seem high - but to our mind you get what you pay for! His framing is excellent. You will find cheaper and we are of course happy for you to organise your own framing. Our framing costs include the additional shipping charges involved.